What type of fuel can biomass boilers use? The Viessmann range of biomass boilers includes boilers that are suitable for burning logs, boilers which are suitable for burning wood chips and boilers which are suitable for burning pellets. Isn’t heating with wood old-fashioned and hard work? Whilst heating wood is a practice which has been in use for centuries, our range of biomass boilers take this age-old way of generating heat and combine it with modern technology. Easy fuel loading and intelligent sensors provide easy, trouble-free operation. How is heat created with biomass? With a biomass boiler, the process of direct combustion is used to burn wood. How should wood be stored? In order to avoid burning damp wood in your boiler, which is uneconomical and can lead to high emissions and tar deposits, wood should be correctly stored. Can anyone heat with a wood boiler? 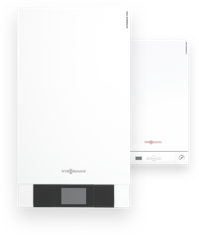 Viessmann wood boilers have been designed to be suitable for almost any house or apartment building. Conversions, for example of the chimney stack, are generally not required. Should you wish to heat your home with a wood boiler, one of the most important requirements is to ensure you have a dry storage area to store the wood that you will be burning. Which is better – heating with logs or pellets? Logs are the perfect choice of fuel if you can obtain the fuel yourself. On the other hand, pellets are a more suitable option if you are relying on having your fuel delivered. Logs will need to be stored and seasoned correctly, whilst pellets are easier to store due to their low residual moisture content. Are biomass boilers environmentally friendly? Yes, biomass boilers burn a renewable fuel source, so they are considered to be environmentally friendly. This is because biomass fuel is wood from quick growing trees. When these trees are felled and burnt, they release the same level of carbon dioxide that they took in when growing, meaning that biomass is considered a carbon-neutral fuel. Are biomass boilers eligible for any grants or incentives? Yes, as they use a sustainable fuel source, biomass boilers are eligible for the UK government’s Domestic Renewable Heat Incentive (Domestic RHI). As part of the incentive, you will receive quarterly payments for seven years in return for the amount of green, renewable heat which your biomass boiler produces. Viessmann advanced wood heating systems achieve emission ratings similar to those of leading heating systems using fossil fuels and meet the strict regulations set out in European clean air legislation.